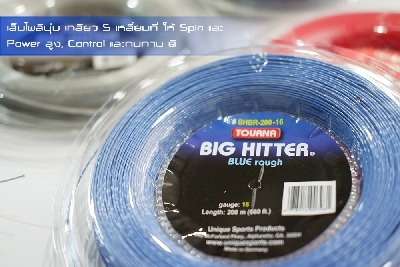 Big Hitter Blue Rough is the same excellent string as the Big Hitter Blue but with a twist. It is crafted into a pentagonal shaped string and then twisted into its final shape. This creates a rough surface that delivers the ultimate spin. The rough, pentagonal surface bites into the ball on every shot. The punishing topspin is absorbed by the superb durability of Tourna Big hitter Rough. Truly a superb engineered string that delivers ultimate in spin, power and control.